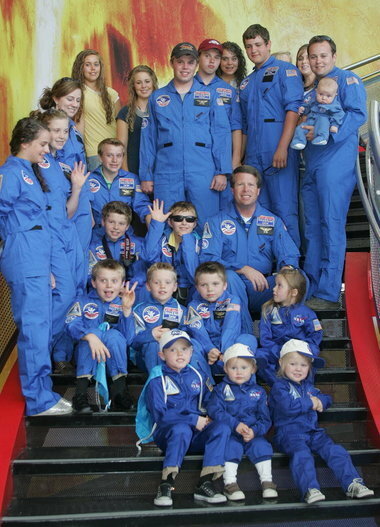 Man, I bet if the Gosselins had lasted another year or two, they'd be going to Space Camp, too. It just seems to be what TLC does... the Roloffs went TWICE and now the Duggars are there... any other families that I don't know about? Anyway, the episode wasn't very noteworthy, and takes place WAY BEFORE the recent episodes. As in, this should take place immediately after the third "World Tour" episode. Why? Because Michelle, Jill, and Josie are STILL IN ISRAEL while the rest of the family visits the space camp. I know the show is losing viewers, and it's getting easier to see why! We all know that Michelle lost the baby. We all know that she announced the pregnancy quite a while ago, episode-wise. Viewers who watch regularly have seen her become more and less pregnant over the past six episodes... this has got to stop. None of these recent episodes have been time-sensitive, so why not show them in order? Seriously. Anyway... there's not much below because not much happened.